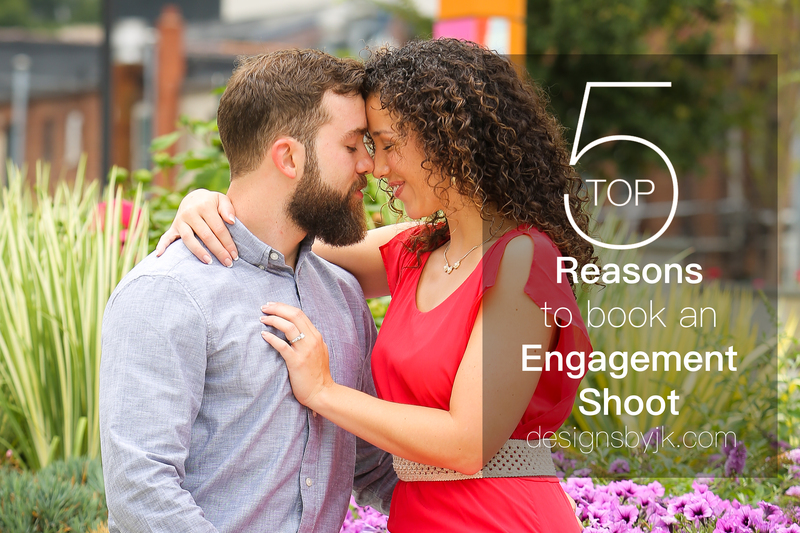 Five reasons every wedding client needs to book an engagement photo shoot. GREAT IMAGES: You will get GREAT images from your engagement session. The photo shoot is tailored around your personalities which helps to capture true moments of you and your fiancé as a couple. These images will become a family heirloom and can be used for Save the Dates, wedding announcements, social media or even used on the day of the wedding. STRONGER RELATIONSHIP: The engagement photo shoot helps us build a stronger relationship with our clients. When you are comfortable in front of the camera it will reflect in your imagery. You will gain a trust in us as your photographer. We will be able to easily communicate which will help improve your wedding day photos. UNDERSTAND POSING: This shoot will help you understand posing. During your engagement session we will teach you how to pose and act in front of the camera. We will give you guidance that will take you from being uncomfortable in front of the camera to knowing exactly what to do. YOUR STYLE: It helps us to get a good vision of your style of imagery. If there are any poses or shots that you like we get to discuss them and practice them before you actual wedding date. Every couple we shoot has a different style and we like to bring that out in your photos. IMPROVE WEDDING IMAGES: Now that you have had practice with us on your engagement session we can move through your wedding day images much quicker which will allow for you to get more photos, better photos and with the precise style of imagery that you want. Time constraints on your wedding day don’t allow for us to teach posing so you will know exactly what to do and not to do to get the best shot. We will both have a better vision of whats expected.